If someone slips on a banana peel in a forest and no one sees it, does anyone laugh? 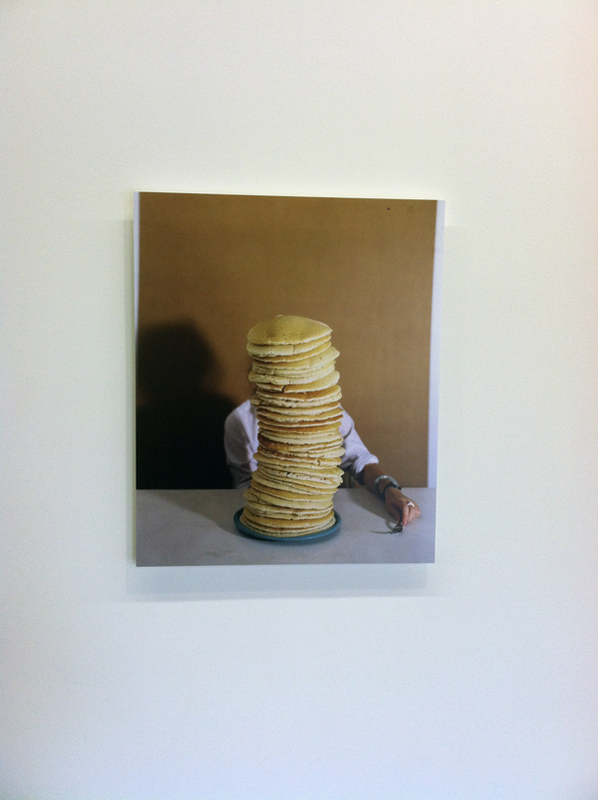 The current exhibition at Atlanta Contemporary Art Center walks us dangerously close to the banana peel. We are the sucker about to unwittingly step onto the banana peel, and the audience waits with bated breath for us to make that final descent into unavoidable disaster. 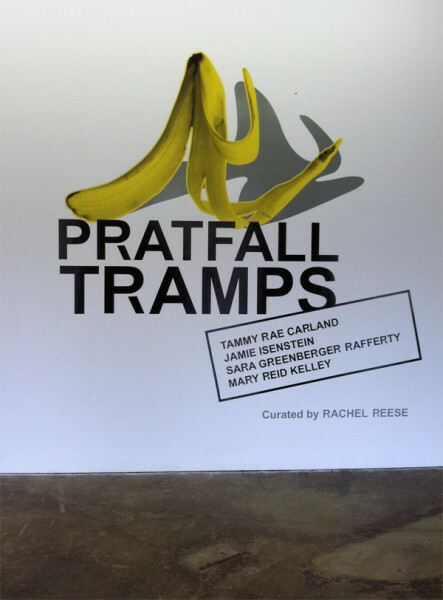 Pratfall Tramps is a sprawling group show, filling the galleries and spilling over into the accompanying Gilda Radner Research & Translation Center. Entering the galleries, the curtain is lifted, setting the stage and revealing the impetus that gathers the seemingly disparate works together. 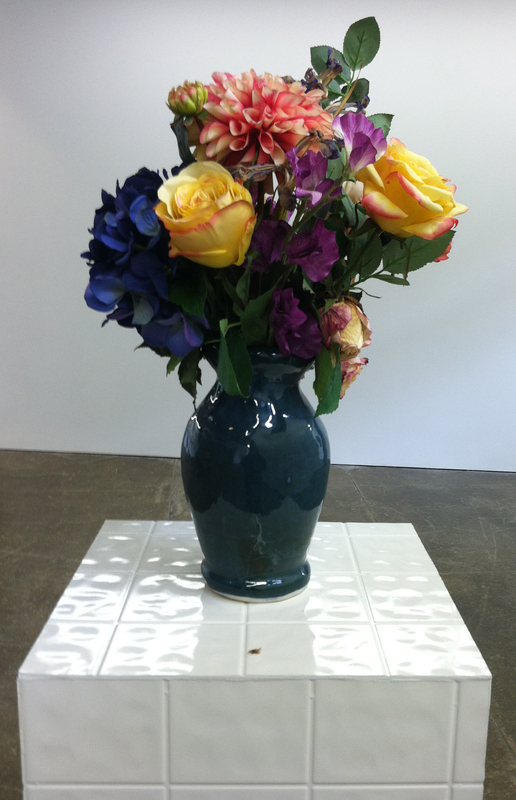 Jamie Isenstein’s Inside Outside Backstage Vase welcomes visitors to the space. From a distance the vase fills with vibrant, fresh flowers, but something is off. Some of the flowers wilt, revealing the perfect false blossoms and crumbling real flowers. A comically large, teetering stack of pancakes obscures Sara Greenberger Rafferty’s Performance Document: Self Portrait With Pancakes. 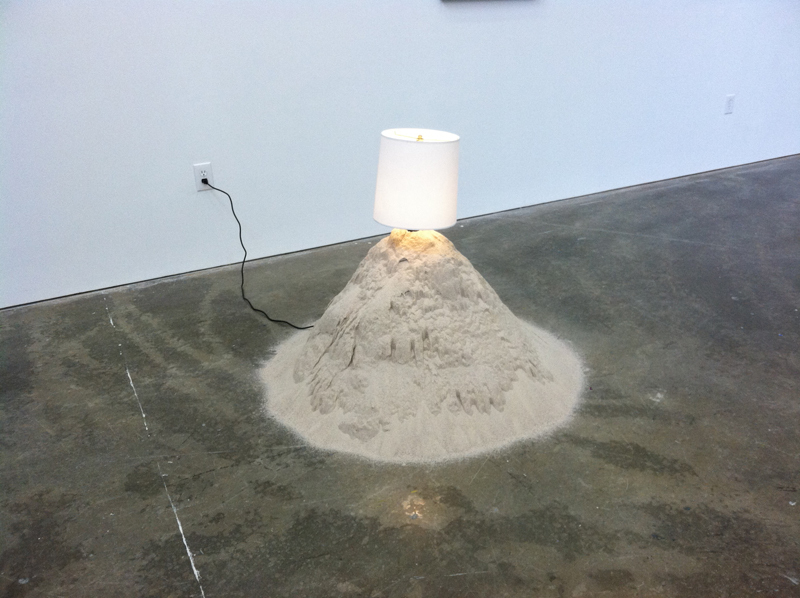 Isenstein’s Sand Lamp is funny as theatre of the absurd is funny. The joy and lighthearted moments of our lives, sheathed in the mundane, ready-made lamp shade burst from the sand that seems to entrap us, yet we cannot realize our electric cord still snakes to find sustenance. Mary Reid Kelley’s Sadie The Saddest Sadist builds from the same tradition. The audio fills the space, looping just often enough to unobtrusively juxtapose its songs, chants, snippets of speech with other works. The mounting layers resist translation, but they create a new way of viewing the works, a shifting, performative veneer over the entire gallery. As the best comedy does, the works reveal larger issues at work in the world. Greenberger Rafferty’s Testing I (Whisk), Testing II (Baster), Testing III (Spoon), Testing IV (Shotgun Whisk), and Testing V (Scoop) anchor the exhibition, upending the tools of performance and standup comedy. It elevates Martha Rossler’s Semiotics of the Kitchen to the stage, making explicit Rossler’s performativity and revealing a silence doubly loud for the lack of amplification and absent performers. 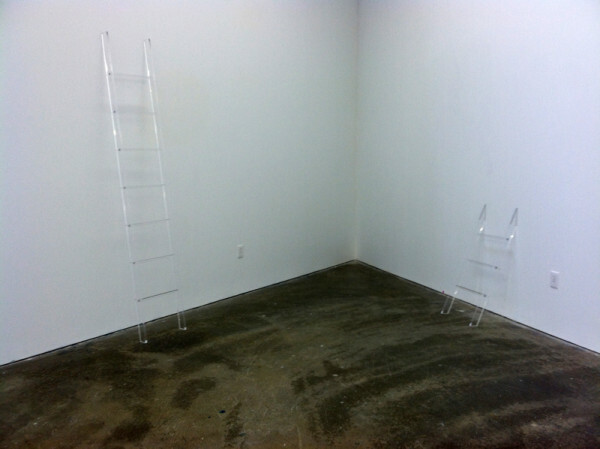 Tammy Rae Carland’s series of acrylic ladders Pratfall Effect lead nowhere. The glass ceiling is not a fixed height. It is everywhere and nowhere. If someone slips on a banana peel as daylight savings time begins, how long does it take for them to hit the ground? Just as the individual works in Pratfall Tramps seem slightly off, the exhibition as a whole does not sit quite right within the gallery. 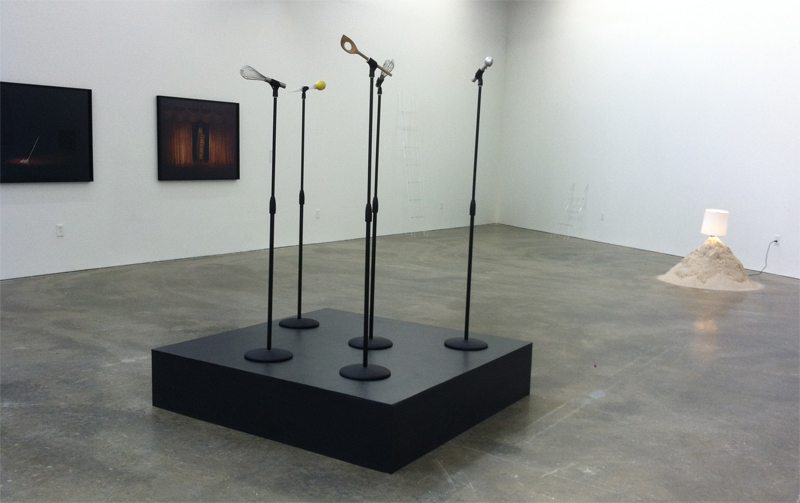 This shifting in the exhibition, however, opens the curtain to an empty stage. We have already stepped on the banana peel, and the embarrassing, laughter-inducing fall is inevitable. We are continually reminded that the exhibition is funny or deals with comedy – the bananas, the artist bios, the accompanying quotes, the title of the show itself. 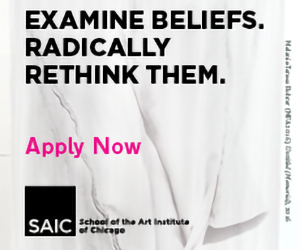 These statements foreclose our ability to interpret the work critically. The show prevents viewers from experiencing the humor in the work by insisting it is funny, that it is successful when it appears to fail. 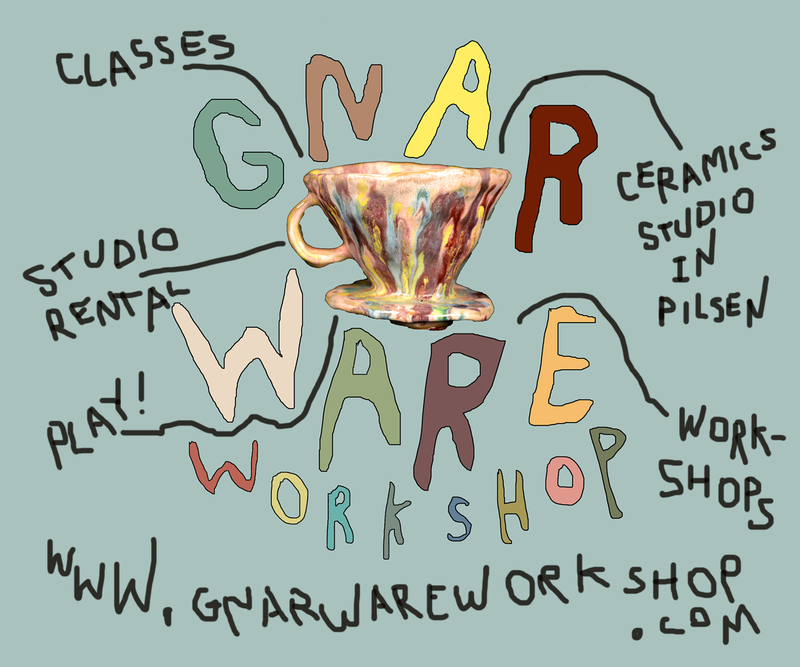 Even if we see the artworks or the artists’ “projects” as failing, seemingly out of place, or unsuccessful, we are told that is precisely when they work the best. The insistence on comedy and the comedic connections underpinning the artists’ work disrupts the exhibition, jars us out of the moments the works immerse us within, lands us on our backs as everyone laughs. We do not need to be reminded how funny it is. The assertions and repetitions undercut the fact that it is a strong show that coheres on its own. If I tell you someone slips on a banana peel, is it still funny?